Today, guests will gather in Chicago to begin this tour. Those who fly in O’Hare International Airport can meet the tour guide at the baggage claim area and transfer to the hotel for free between 9:00am and 9:00pm. Those who arrive before 3:00pm will also receive free transportation to the Chicago Premium Outlets to do a little shopping. Any guests who arrive before 5:00pm are also invited to take a Night Tour of this marvelous city for $25 per person (a minimum of 4 guests is required for this tour to be arranged). In the morning, we will leave the hotel and have the entire day to explore Chicago at our own pace. It is highly recommended that guests visit the Chicago Theater, the unofficial emblem of the city. They can also take a cruise along the Chicago River or take an in-depth walking tour. They can take pictures in front of the Cloud Gate and Crown Fountain. Then, they can take a walk through Millennium Park. 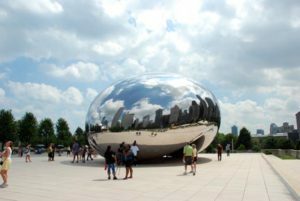 Other great places to visit include the Shedd Aquarium, the largest indoor aquarium in the world; and the campus of the University of Chicago, which includes Robie House, a Frank Lloyd Wright masterpiece, and Midway Park, built for the 1893 World Expo. They should also consider watching a basketball game at the United Center, home of the Chicago Bulls, and sample some of the city’s best cuisine. Today, guests will have one more day to explore Chicago at their own pace. Some suggested places to visit include the Art Institute, considered the best museum in the world by Trip Advisor; the shops on Michigan Avenue; Michael Jordan’s restaurant; and the Old Water Tower, the only remaining piece of architecture after the 1871 fire. Around 4:00pm, guests will transfer to O’Hare Airport for their departure flights. Please see “Departure and Return” for more detailed information regarding when to schedule flights. Airport Meetup: Meet the tour guide at the baggage claim area at O’Hare, where pick-up service is available between 9 AM and 9 PM; charged pickup service is available for $120/person on 1st and 2nd guest, and $10 for each additional guest; at MDW, you have to get to the hotel by yourself. Flight arrangement: There are still travel activities on the last day of the tour, please schedule flights to depart from Chicago O’Hare airport after 7:00pm. A mandatory service fees for airport pickup: Minimum $8 / day / person should be paid in cash to tour guide and the bus driver as a service fee. Any child / Infant reserving a seat will have to pay the service fees as well. Any private expenses like transportation and admission fees on your free days.